In this work the catalytic application of tartataric acid is reported for the first time for the synthesis of 2, 3-dihydroquinazolin-4(1H)-ones in water at room temperature conditions at 28°C-30°C. The protocol offers various advantages such as mild reaction conditions, green reaction media, maximum yields, simple workup and use of safe and easily available catalyst. Quinazolinone belongs to an important class of heterocyclic compounds because of their wide range of medicinal properties. Quinazolinone compounds found to contain numerous activities such as antibacterial , bronchodilator , anti-inflammatory , antihypertensive , anticonvulsant , antimalerial , anticancer  and herbicidal . Because of their important biological properties and huge applications, the development of new strategies for their preparation is of fundamental importance. The common method for the synthesis of 2, 3-dihydroquinazolin-4(1H)-ones is the condensation of 2-aminobenzamide with aldehydes or ketones. Various catalytic systems have been reported for the two-component synthesis of 2, 3-dihydroquinazolin-4(1H)-ones, which include aerosil silica-supported acidic ionic liquid , trifluoroethanol , supramolecular synthesis , ZrCl4 , heteropolyacid-clay nanocomposite , amberlyst-15  and sulfamic acid . However, some of these methods have drawbacks in terms of the use of costly and excess amount of catalysts and higher temperature, long reaction time and lower yields. Hence, the development of a convenient and high- yielding eco-friendly protocol for the synthesis of 2, 3-dihydroquinazolin-4(1H)-one scaffolds is still warranted (Figure 1). The designed and development of convenient, operationally simple and eco-friendly strategies for the synthesis of biologically important organic and medicinal compounds are the most significant objectives in organic synthesis [16-20]. 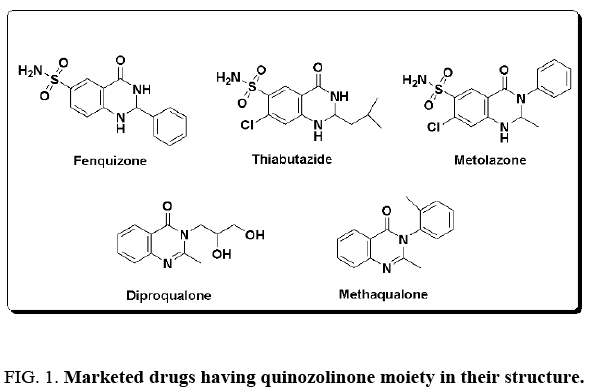 Figure 1: Marketed drugs having quinozolinone moiety in their structure. Solvents as reaction medium often account for the huge bulk of mass wasted during organic synthesis and industrial processes . As a result, there has been more focus on the problem of replacing traditional toxic organic solvents with non-toxic greener ones. Water sometimes referred to as a benign ‘Universal Solvent’ as it is most abundant and safest solvent. Moreover, the water has exceptional properties as a solvent such as enhanced reactivity and selectivity caused by hydrophobic packing, polarity, and hydrogen bonding therefore it has attracted synthetic chemists to use it as an advantageous alternative to hazardous and expensive organic solvents [22-25]. Tartaric acid is a less expensive, safe, easy-to-handle and none toxic acid. Not much work has been done on the efficiency of tartaric acid as a catalyst in organic transformations. All chemicals and solvents were purchased from commercial suppliers and used without further purification. The reactions and purity of the products were monitored by thin layer chromatography (TLC) using silica gel coated aluminum sheets. Melting points are determined on open capillary tubes and are uncorrected. NMR spectra were recorded on a Bruker advance II 400 NMR Spectrometer. Synthesis of 2, 3-dihydroquinazolin-4(1H)-ones: L-Tartaric Acid (20 mol%) was added to a solution of anthranilamide (1, 1 mmol) and aldehyde (2, 1 mmol) in water (5 mL). The mixture was stirred at room temperature for 15-60 min. After reaction completion as monitored by TLC the reaction mixture was poured in ice cold water and the precipitated solid was collected by filtration. Then it was recrystallized from EtOH-H2O to afford the pure product. 2-(4-hydroxyphenyl)-2, 3-dihydroquinazoline-4(1H)-one: White solid; mp 279-281°C; 1H NMR (400 MHz, DMSO-d6): δ=9.51 (s, 1H), 8.35 (s, 1H), 7.59-7.61 (m, 3H), 7.4 (d, J=7.6 Hz, 2 H), 7.23-7.27 (m, 1H), 7.15 (s, 1H), 6.74 (d, J=7.6 Hz, 1H), 6.74 (t, J=7.6 Hz, 1H), 5.75 (s, 1H). MASS (EI, 70 eV): m/z (%)=240 (M+, 14), 239 ([M-1]+, 22), 147(100), 120(65), 119(47), 92(40), 65(31). At the outset, the standard and model reaction conditions were established by the model reactions of 4-chloro benzaldehyde (1 equiv) with 2-aminobenzamide (1 equiv) in different solvents and in the presence or in the absence of acids (Table 1). The best results were obtained from reaction of these components in water at room temperature in the presence of 20 mol% of L-tartaric acid (Table 1, entry 4). Other acid catalysts under same reaction conditions afford poor to moderate yields (Table 1, entry 6-8) whereas in the absence of any acid catalyst no product was observed (Table 1, entry 5). To investigate the generality and scope of this protocol, a variety of other aromatic aldehydes (containing electron donating or withdrawing group on the ring) were reacted with 2-aminobenzamide. The activating nature of these groups on the aromatic ring had no significant effect on efficiency of the protocol. So we can say that the synthesis of 2, 3-dihydroquinazolin-4(1H)-ones using tartaric acid as a catalyst under room temperature conditions is undeniably an effective protocol and far better to some other reported methods with respect to yields, reaction time, availability and non-toxicity of the catalyst (Table 2). Table 1: Optimization of the reaction conditions for the synthesis of 2, 3-dihydroquinazolin-4(1H)-ones. Table 2: Synthesis of 2, 3-dihydroquinazolin-4(1H)-ones. A plausible mechanism for the formation of 2, 3-dihydroquinazolin-4(1H)-ones is shown in Figure 2. The carbonyl group of aldehyde is activated by protonation with the aid of tartaric acid and enhances the electrophilic character of aldehyde followed by nucleophilic attack of the amino group of 2-aminobenzamide at the activated carbonyl group which after dehydration affords imine intermediate. The imine intermediate after protonation from acid followed by cyclization gives 2, 3-dihydroquinazolin-4(1H)-ones as a final product. Figure 2: Proposed mechanism for the synthesis of 2, 3-dihydroquinazolin-4(1H)-ones. A new protocol have been developed for the synthesis of 2, 3-dihydroquinazolin-4(1H)-ones promoted by tartaric acid as catalyst in water medium at room temperature reaction conditions. Maximum yields, cost effectiveness, short reaction time, easy workup are the merits of this protocol. Kung P, Casper MD, Cook KL. Structure-activity relationships of novel 2-substituted quinazoline antibacterial agents. J Med Chem. 1999;42:4705-13. Tyagi, Goel R, Srivastava B, et al. Quinazolinonesas potential anti-inflammatory agents A. Indian J Pharm Sci. 1998;60:283-6. Singh T, Srivastava T, Sharma Shalabh VK, et al. Synthesis, insecticidal and antimicrobial activities of some heterocyclic deriatives of quinazolinone. Indian J Chem. 2006;45B:2558-65. Raghu Ram AR, Bahekar RH. Synthesis of benzimidazo[1,2-c] quinazolines as possible bronchodilators. Indian J Chem. 1999;38(B):434-9. Zappala M, Grasso S, Micale N, et al. 1-Aryl-6, 7-methylenedioxy-3H-quinazolin-4-ones as anticonvulsant agents. Bioorg Med ChemLett. 2003;13:4427-30. Murata K, Takano F, Fushiya S, et al. Enhancement of NO production in activated macrophages in vivo by an antimalarial crude drug, Dichroafebrifuga. J Nat Prod. 1998;61:729-33. Roopan SM, Khan FN, Jin JS, et al. An efficient one-pot three component cyclo-condensation in the synthesis of 2-(2-chloroquinoline-3-yl)-2,3-dihydroquinazoline-4(1H)-ones:potential antitumor agents. Res ChemIntermed. 2011;37:919-27. Wang DW, Lin HY, Cao RJ, et al. Synthesis and herbicidal evaluation of triketone-containing quinazoline-2,4-diones. J Agric Food Chem. 2014;62:11786-96. Yassaghi G, Davoodnia A, Allameh S, et al. Solvent-free selective cross-aldol condensation of ketones with Aromatic aldehydes, efficiently catalyzed by a reusable supported acidic ionic liquid. Bull Korean Chem Soc. 2012;33:2724-30. Qiao RZ, Xu BL, Wang YH. A facile synthesis of 2-substituted-2,3-dihydro-4(1H) quinazolinones in 2,2,2-trifluoroethanol. Chin ChemLett. 2007;18:656-8. Ramesh K, Karnakar K, Satish G, et al. A concise aqueous phase supramolecular synthesis of 2-phenyl-2,3-dihydroquinazolin-4(1H)-one derivatives. Tetrahedron Lett. 2012;53:6936-9. Abdollahi-Alibeik M, Shabani E. Synthesis of 2,3-dihydroquinazolin-4(1H)-ones catalyzed by zirconium (IV) chloride as a mild and efficient catalyst. Chin ChemLett. 2011;22:1163-6. Dar BA, Sahu AK, Patidar P, et al.Heteropolyacid-clay nano-composite as a novel heterogeneous catalyst for the synthesis of 2, 3-dihydroquinazolinones. J IndEng Chem. 2013;19:407-12. Murthy PVNS, Rambabu D, Krishna GR, et al. Amberlyst-15mediated synthesis of 2-substituted 2, 3-dihydroquinazolin-4 (1H)-ones and their crystal structure analysis. Tetrahedron Lett. 2012;53:863-7. Rostami A, Tavakoli A.Sulfamic acid as a reusable and green catalyst for efficient and simple synthesis of 2-substituted-2, 3-dihydroquinazolin-4 (1H)-ones in water or methanol. ChemLett. 2011;22:1317-20. Dar B A, Mohsin M, Basit A, et al. Sand: A natural and potential catalyst in renowned Friedel Craft's acylation of aromatic compounds. J Saudi ChemSociet. 2013;17:177-80. Ali N, Ali S, Patel SZM, et al. Synthesis of new α-aminophosphonate system bearing Indazole moiety and their biological activity. Eur J Med Chem. 2012;50:39-43. Bora RO, Dar B, Pradhan V, et al. [1,2,4]-Oxadiazoles: Synthesis and biological applications.Mini Rev Med Chem. 2014;14:355-69. Dar B, Pandey N, Farooqui M, et al. Solvent-free, scalable and expeditious synthesis of benzanilides under microwave irradiation using clay doped with palladium nanoparticles as a recyclable and efficient catalyst. Green ChemLett and Rev. 2015;8:2:1-8. Dar B, Khalid S, Wani TA, et al. Ceria-based mixed oxide supported CuO: An efficient heterogeneous catalyst for conversion of cellulose to sorbitol. Green and Sustainable Chem. 2015;5:15-24. Beach ES, Cui Z, Anastas PT. Green chemistry: A design framework for sustainability. Energy Environ Sci. 2009;2:1038-49. Rideout DC, Breslow RLJ.Hydrophobic acceleration of Diels-Alder reactions.Chem Soc. 1980;102: 7816-7. Heravi MM, Mousavizadeh F, Ghobadi N, et al. A green and convenient protocol for the synthesis of novel pyrazolopyranopyrimidinesvia a one-pot, four-component reaction in water. Tetrahedron Lett. 2014;55:1226-8. Wagare SD, Farooqui M, Durrani A. Efficient and green microwave-assisted one pot synthesis of azaindolizines in PEG-400 and water.SynComm. 2016;46:1741-6. Nidhi G, KumarKV. Tartaric acid-catalyzed synthesis of α-aminophosphonates under solvent-free conditions.Synthetic Communications. 2011;41:2800-2804.